UPDATE: This post is now re-published at Salon (in slightly abridged form)! OK, I take it back. For the last six years or so, I’ve written countless articles, essays, and blog posts criticizing the lack of racial and size diversity on fashion runways and in print editorials. I’ve argued for the need to expand the industry’s vision for the types of bodies that could represent what is beautiful and fashionable so that the torrent of images that permeate the everyday lives of so many different women and girls might reflect the broad range of body types and sizes of the industry’s target and accidental audiences. But never mind. I take it back. Fashion should stop trying to be inclusive. Stop trying to be diverse. Recent efforts to diversify fashion runways and editorials have made me both sigh and groan. I sighed when I read the letter written by the Diversity Coalition (an organization formed by Black American and British models Bethann Hardison, Naomi Campbell, and Iman) calling out the fashion powers-that-be for their inattention and inaction when it comes to racial diversity in modeling. Their letter effectively sets Asian models apart from other models of color. 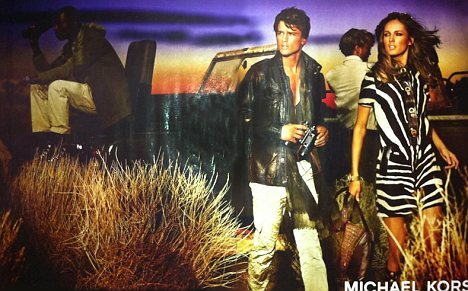 Apparently, Asian models don’t count as racial diversity. The notion that Asians are not real people of color or are “honorary whites” serves racism by denying anti-Asian racism—which has a long and enduring history in fashion. It also advances a deep-seated divide-and-conquer approach to race relations that ignores the way racism impacts all racialized people. Believing the hype that Asian models are untouched by the fashion industry’s systemic racism requires that we ignore the reality of their under representation. Jezebel’s survey of nine New York Fashion Week seasons between 2008 and 2013 shows that Asian models never comprise more than 10 percent of turns on the runway. In five of the nine seasons, Asian models have less representation than Black models. And in the four seasons in which there are more Asian models represented, the difference is minimal—falling somewhere between .5 percent and 3.1 percent. 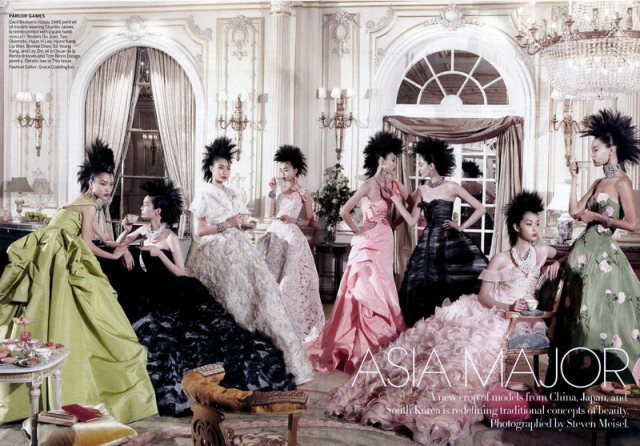 This month, during NYFW Spring 2014, Asian models outnumbered Black models by the very slimmest of margins, .02 percent. By no stretch of the imagination can we take these numbers to be evidence that Asian models somehow have it easier in the fashion industry than other nonwhite models. Across these ten seasons, white models never make up less than 79.4 percent. This massive disparity can only be the result of the fashion industry’s systemic racism that inordinately benefits white models and disadvantages all nonwhite models. While I applaud the Diversity Coalition’s mission and efforts, I’m holding out hope that it doesn’t reproduce the same kinds of racial exclusions it intends to critique. 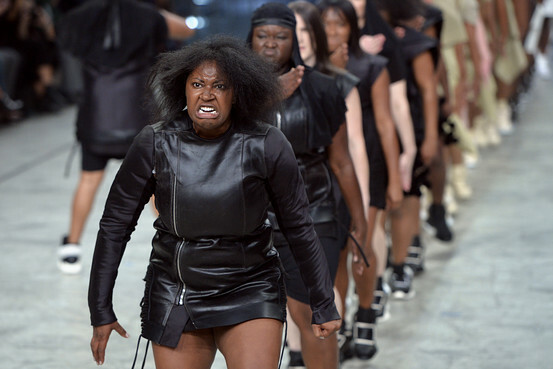 As an example of the groan-inducing moment in recent fashion history, I turn to the buzziest show of the season: Rick Owens’ show in Paris in which he used teams of mostly African American step dancers to introduce his Spring 2014 ready-to-wear line. The fashion media—so far—has universally praised the show as a “powerful” move by a leading fashion designer to overturn the industry’s dominant racial order. But “power” is exactly what’s missing in this show—and, for that matter, what is missing in the discussions about this show and about racial diversity in fashion in general. To pass muster as real change would require the racial dynamics of power that structure fashion’s visual cultures and practices be disassembled. Instead, Owens’ show represents a continuation of the same hierarchies of race and power that make it possible for a famous white designer to request that predominantly young Black women serve up “a routine that embodie[s] viciousness” for a mostly white audience. people of color used as embodied evidence of the “multicultural cool” of the white designer, white brand, white magazine, etc. Click the image to see my post about this film and the issue of “multicultural cool”. What each of these categories share, and what links them as liberal multiculturalist posturing (as opposed to radically substantive change) is that each of these multicultural moments unfolds and emanates from the privileged and controlling perspective of whiteness. In these situations, the standards of beauty—as well as the standards of unconventional beauty—are established and contained by white perspectives and white needs for racial difference. Owens has said that he chose to introduce his spring 2014 line through step because he was “attracted to how gritty it was.” In the context of racial spectacles, what is important is not the cultural history or cultural present of the cultural practice on display; what is important is the display of racial difference itself. The significance of racial difference for its own sake (rather than for the sake of social and cultural political equity) is summed up in Suzy Menkes’ review for the New York Times in which she describes “the joy of seeing a sea of black faces”. Owens’ show and the popular discussions about it are reflective of a general misunderstanding about the ways that racism and exploitation work. As I wrote in another post, racism is not about individual intention. Well-intentioned people speak and act in ways that reinforce racism all the time. The only way to undo racism is to fundamentally alter the structures that enable whites to benefit from racism and people of color to be exploited by it. And just as racism doesn’t require intention, exploitation doesn’t demand dominance. It is entirely possible for fun and gratifying experiences to be exploitative. (For more on this, see Mark Andrejevic’s excellent essay, “Estranged Free Labor.”) The dancers surely enjoyed the global spotlight, the free trip to Paris, and the free designer clothes that I imagine Owens allowed them to keep as a gift and because these outfits were individually tailored for each dancer’s body. Stepper Adrianna Cornish tells reporters that the experience is “something [she] never would have dreamed of”. A blogger for the Wall Street Journal notes that “some guests dabbed tears during the show” and that dancers themselves were “wiping tears” from their cheeks following the performance. To draw attention to the exploitative conditions of the performance is not to deny or diminish the fact that the show was emotionally moving for some of its participants and observers. But if racism is not necessarily a product of personal feelings and intentions then anti-racism cannot be achieved at the level of personal feelings either. So how do we know racism or exploitation when we see it? (Hint: they are usually conjoined.) A quick and handy litmus test is one in which the following two questions are answered positively. Does one party benefit, not just more but disproportionately more, from the multicultural event than the other participating party? Does this relation of benefits mirror and repeat the prevailing social relations that already structure dominant society? If the answer to both questions is “yes” then it is a pretty good bet that the multicultural event is racially exploitative. Thanks to the deluge of reviews, of Instagram photos and videos, and tweets, Owens’ brand is winning in the attention economy that now drives fashion in the age of social consumerism. And if others felt the way a Dazed Digital reporter did after the show—wanting “to clear [her] savings [and] buy a Rick Owens leather jacket”—then this publicity will also generate sales. The dancers, on the other hand, the women whose bodies, energy, and time made the show will be remembered only as Owens’ dancers. The few dancers that have been interviewed and named will be forgotten but Owens’ bold statement, his powerful message, and his creative vision will be memorialized in fashion history. In academic language, Owens will be remembered as the agent of the show while the dancers will be remembered as the people who instrumentalized his agency, his vision, and his mission. So I repeat: the global fashion industry should stop trying to be inclusive, stop trying to be diverse. Rather than count racial bodies, it should begin recalibrating its structural dynamics of race, power, and profit so that a statement like Menkes’ that “the imagination of the [white male] designer is the greatest achievement of the show”—a show brought to life by the talents and hard work of mostly Black women dancers—is simply unthinkable.